I'm enough of a curmudgeon that I still grouse now and then about those qualified-yet-unqualified "quality products"-- do they mean high quality? Fair-to-middling? Nothing to write home about? And I do enjoy a good sign. So imagine my delight, strolling with my family on Sunday afternoon, toward the end of a day of beach walking and sunshine and yes-it's-still-summer, when we came upon this lovely painted sign, offering not just quality, but quality new and used. Looks like a warehouse, doesn't it? I bet they have lots. 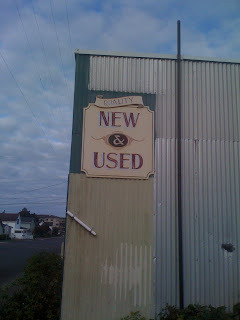 Or maybe slightly used? 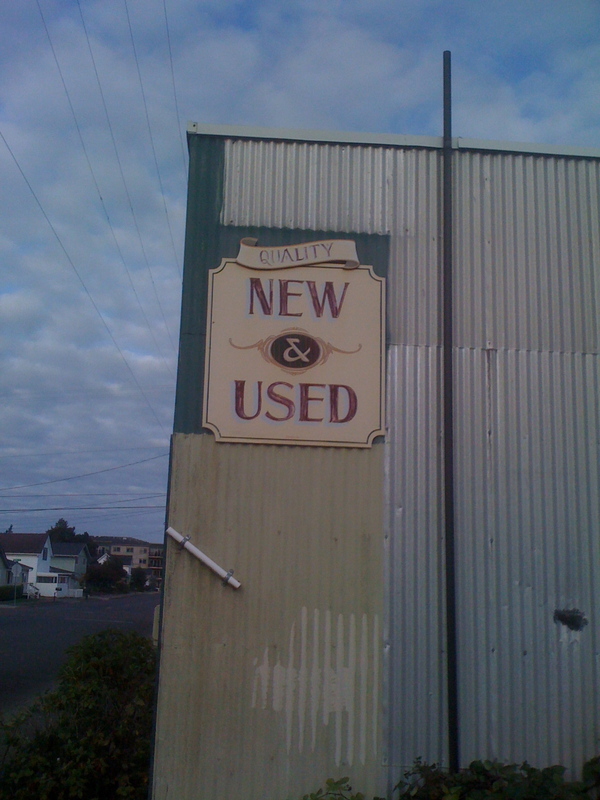 Gently used? Still has some wear in it, too good to throw out, a (quality) solution in search of a problem, deserving of a second chance, an oldie but a goodie, don't knock it if you haven't tried it? Tarnished, but worthy of a little polish and elbow grease. Hot off the presses, brand-spankin'-new, old as the hills, down at heels, wet behind the ears, dog-earred, slightly foxed, fine condition, classic, pride of ownership, in need of TLC, great potential, a find at any scratch and dent sale, an opportunity not to be missed. I wonder if they sold clichés, set phrases, proverbs, sayings, idiomatic tags impossible to translate, improbable promises? Sadly (or happily) it was Sunday afternoon. The shop was closed. We drove home empty-handed--on the quality front--but full-bellied and laden with beach agates, shell fragments, sand between our toes and in our jeans cuffs and still all over the back of the car, two days later.